WordPress vs Squarespace: Which is the Best Choice For Your Design Clients? Which one is the better platform for your clients? Which one should you choose? Can we settle this WordPress vs Squarespace debate for once and for all? Before we dive into the specifics of each platform, let’s get one thing out of the way: one platform is not better than the other. Yes, you heard that right. I, a WordPress developer, am saying that WordPress is not better than Squarespace and vice versa. WordPress and Squarespace are like apples and oranges. They’re both website platforms, but they both give you different benefits. Some people will prefer one over the other, but that doesn’t make either one bad. So then if they’re both good platforms, what do each excel at and which one should you choose for your clients? WordPress is clearly my favorite platform, but I will admit it’s not for everyone. Here’s a look at the pros and cons of WordPress. Coding Knowledge Required – Unlike Squarespace which allows you to drag and drop elements or change colors with the click of a button, WordPress requires you to actually know some code in order to customize your site. However, nowadays there are plenty of themes and plugins that provide that functionality, so all isn’t lost! 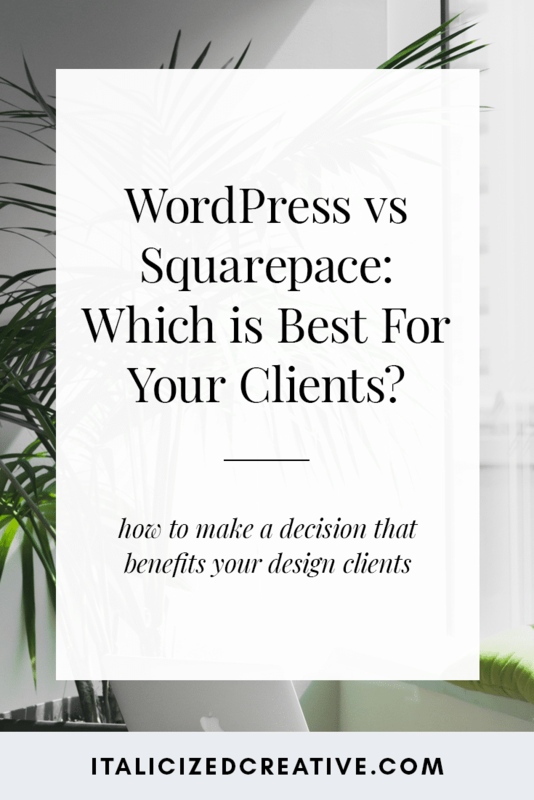 WordPress vs Squarespace: What is the best choice for your clients? So how do you choose a platform? Think about what’s most important to your clients. What platform satisfies the majority of these wants? With that being said, when choosing between WordPress and Squarespace think about what your clients want out of a site now in addition to what they may want in the future. If they are just looking for a simple site now, but have grand plans for a feature rich site down the road, it might be a better choice to just get started with WordPress instead of having to deal with migrating over in the future. But if they just want to blog away and don’t foresee themselves needing anything fancy in the future, then maybe Squarespace is a good choice for them. The key is to think about their needs. Everyone has an opinion on this topic, but as a designer helping your client create a functional website, you know what’s best for them and their needs. What works for one person won’t necessarily work for another. So while I 100% recommend WordPress, I understand that it’s not for everyone. For some people Squarespace will be a better fit. And you know what? That’s okay. There’s room for both platforms to coexist.